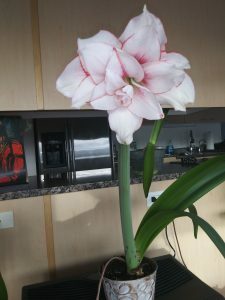 I really like Amaryllis because they are beautiful, and easy to grow, and they are one of the few houseplants that will produce beautiful blooms indoors! Also, they will bloom year after year if taking care of properly. Choose the largest that you can find. They will produce more stocks and blooms than smaller bulbs. The larger the bulb, the more flowers it will produce. Bulbs should be firm and dry with no signs of mold, decay or injury. Very often you will see leaves, or buds growing from unplanted or planted bulbs. Select bulbs with bright green new growth and without visible damage. Some bulbs may have an offshoot growing from its base. This will eventually grow into a new bulb and can be removed and planted separately. Amaryllis grow best in narrow containers. Containers may be made of plastic, metal, ceramic or terracotta. Bulbs should be firm and dry with no signs of mold, decay or injury. Select a container that has one or more holes in the bottom and drains easily. Good drainage will minimize the chance of bulb or root rot (rotting from excess moisture). The diameter of the pot should be about 1 inch wider than the widest part of the bulb and twice as tall as the bulb to allow space for good root development. Fill the pot about half full with sterile, new potting soil high in organic matter such as peat moss. Set the bulb in the pot so the roots rest on the potting soil. The bulb should sit up above the edge of the container. Add more soil, tapping it down around the bulb, until one-third to one-half of the bulb remains visible. Firm the potting medium around the bulb. Set the pot in a sink where it can drain freely and water until the potting soil is thoroughly moist. Allow to drain completely. Set the pot on a trade that will catch water, and find a sunny window for it. Water the plant when the top 2 inches of soil feels dry, allowing the container to drain freely each time. Do not let the plant to sit in water as wet soil can promote bulb and root rot and attract pests. Fertilize amaryllis each time you water at half the recommended strength when new growth is visible (including on newly purchased bulbs). To promote blooming, use a houseplant fertilizer with a high phosphorus content. Fertilizer packaging always provides an analysis shown in three numbers such as 10-20-15. These numbers represent the percentage of each of three important macronutrients for plant growth: N (nitrogen) – P (phosphorous) – K (potassium). In this example, the fertilizer contains 10 percent nitrogen, 20 percent phosphorous, and 15 percent potassium. Move the plant out of direct sunlight when the flower buds have begun to open. 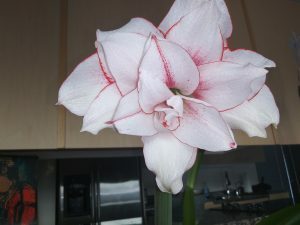 The key to keeping Amaryllis alive for years is keeping the plant actively growing after they have finished blooming. After the flowers have died, cut them off to prevent seed formation. It will rob the plant of energy it needs to bloom the next year. Do not remove the flower stock until it has turned yellow. A green stem will continue to promote photosynthesis, which creates energy that is stored in the bulb for future leaf growth and flowers. If the bulb does not produce a flowering stalk in the next year, it is probable that the plant has not stored enough nutrients during the post-blooming period. Keeping the plant healthy and growing will promote blooming. After your plant has finished blooming, place it in a window that gets the most sun possible. It will continue to grow long, slender leaves. These leaves will aid the process of photosynthesis. Continue to water and fertilize the plant regularly with an all-purpose houseplant plant fertilizer. Most websites recommend placing the Amaryllis outdoors during summer, but I have no place toput it, and I have found that they will rebloom without being placed outside. more information on that website about repotting, and pests.